Well, the stitch is honeycomb blanket stitch. 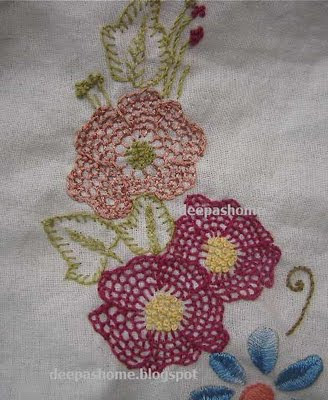 If you remember, it was a part of my ROSE sampler project. 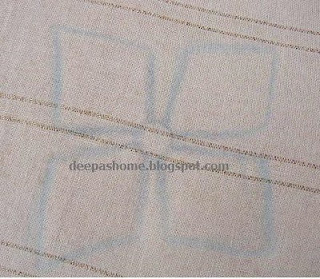 This stitch is also known as fishscale stitch. See the tutorial here.The center is filled with French knots. The leaves are also blanket stitched with feather stitch vein in the middle. 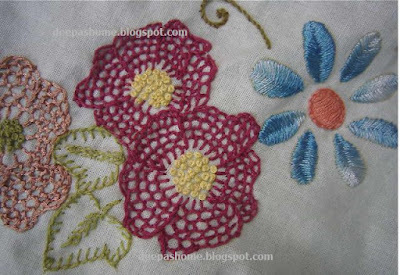 The brown flower is stitched with strands from silk skeins kindly sent to me from Delhi by a very good friend of mine, Anu.It was a first time experience for me since in my place we get silk threads only in spools. I used all the six strands for the heavy look. The colors are slightly different, right? Got the brown,green combi from the work on the dress of a friend of mine. The first time I stitched the leaves, I filled them with fishbone stitch. But it was a mess. Had to pull out the whole thing and restitch all over again. Learnt a lesson the hard way - never attempt fishbone stitch on wide leaves. Long ones will work fine, but wide ones...no,no. what a great find! will get started on it. thank you! Lovely Deepa, you always have such interesting and educational posts. beautiful deepa..you are doing a great job.. looking forward to see next block n anxiously waiting to see the whole floral wrath! !2 more blocks to go rite?